Paul Needles trained as a teacher at St Paul's Teacher Training College, Cheltenham from 1965 until 1968. He taught in Kent for the first five years of his teaching career and from 1973 he taught in Bristol and South Gloucestershire until his retirement in 2006. His teaching career started at Temple Secondary School for Boys in Strood, Kent where he taught art and ceramics, becoming head of ceramics in 1971. In 1973 he returned to his native Bristol to become head of the Art Department at Merrywood Boys' School in south Bristol where the department gained an unprecedented reputation for producing lively and interesting work using all art media. For some fifteen years the school exhibited at the National Exhibition of Children's Art every year until the exhibition closed in 1991; in the latter years the number of exhibits from Merrywood Boys' School outnumber those from any other school in the country. Paul's greatest satisfaction from his time at Merrywood was gained from enabling the less privileged children to realise a level of success in their art endeavours and from seeing them grow in confidence as a result. In 1991 he moved to The Castle School in Thornbury, a small market town in South Gloucestershire some 10 miles north of Bristol, although he continued to live in south Bristol. His first role at Castle was as head of the Creative Faculty where he had oversight of all forms of art - including music, dance and drama - and the craft design technology department. Within a few years under his guidance the expressive arts had grown to such an extent that Expressive Arts became a faculty in its own right with him at the head. In 2002 The Castle School gained specialist schools status in Visual Arts and he became the Director of the Arts College. He retired from Castle in December 2006. Throughout his teaching career Paul continued to practice his art in all forms but especially in drawing and painting, and exhibited his paintings in various exhibitions, including several individual exhibitions. Retirement has brought more time to paint and has given Paul the time and space to expand his print making experience. Where much of his painting is of landscape, his printmaking has given Paul the opportunity to do more figurative work - in his preferred medium of lino cuts. 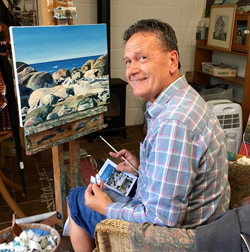 Much of Paul's inspiration for his paintings comes from the local landscape in the south of England and from his holidays in France and Spain. Paul works in a studio at his home in south Bristol.